Anti-Oxident Coffee Substitute	There are 2 products. Raja means king and the recipe used for this coffee substitute is exactly the same as that used by the kings of ancient India, who drank it to obtain bliss and good health. This highly concentrated powder can be boiled in water or milk and served with sugar according to taste. 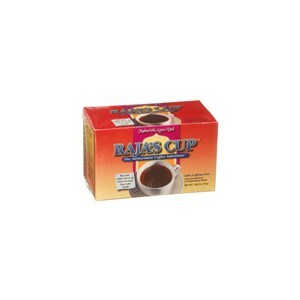 Raja's Cup is caffeine-free and is soothing yet gently reviving.